Cooee Busways – a bus that comes when you call it! Cooee Busways is a new On Demand public transport trial operating in the Mid-North Coast under the NSW Government’s Rural & Regional On Demand public transport pilot program. 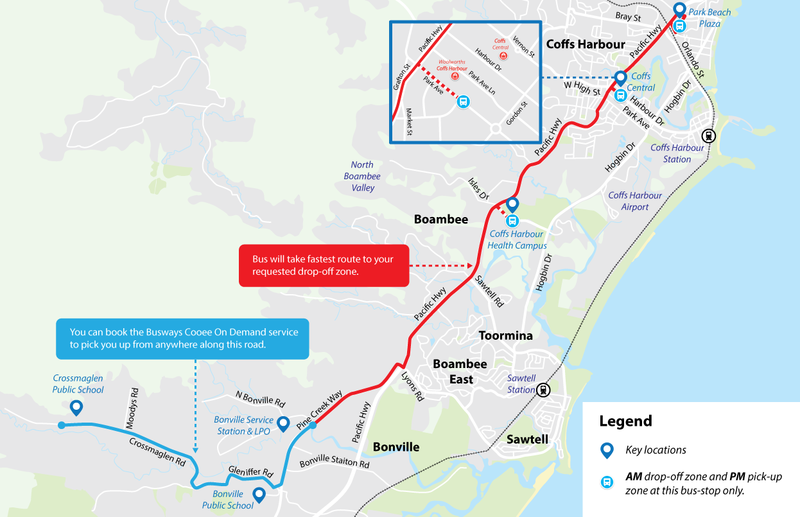 Cooee Busways services commenced on Wednesday 16 January 2019 and operates a same-day return service every Wednesday (except public holidays). The pilot will utilise existing school buses, between school drop-off and pick-up times, to deliver these new services to participating customers. The overarching objective of the NSW Government’s On Demand Pilot Program is to test and learn through the delivery of temporary pilots new and creative transport services. Cooee Busways is exploring the potential for On Demand to provide customers living in rural areas such as Aldavilla, Coramba, Rollands Plains, Telegraph Point, Thrumster and Yarravel access to major city and town centres at a low cost. Help us understand how our On Demand bus service can best meet your community needs by completing this short Community Travel Survey. The school bus finishes school service at Karangi PS at 9.00am and is available to commence the Cooee Busways service. Drop off locations and times will vary depending on the number of passengers. Times will be confirmed via a phone call the day before. The school bus finishes school service at Bonville PS at 9.00am and is available to commence the Cooee Busways service. The school bus finishes school service at Aldavilla Primary School at 8.55am and is available to commence the Cooee Busways service. The school bus finishes school service at St Josephs Regional College at 8.25am and is available to commence the Cooee Busways service. The school bus finishes school service at Rollands Plains Upper PS at 9.05am and is available to commence the Cooee Busways service. You can make a booking from up to one week in advance up to 4.30pm the day before your trip. Call us on (02) 9497 1870 between 7am and 4.30pm, Monday to Friday (except public holidays) or fill in the form below and our representative will get back to you shortly. Is the drop off address the same as the pick up address? Do you require assistance accessing the bus? Cooee Busways is a new On Demand public transport trial operating in five communities on the Mid-North Coast under the NSW Government’s Rural and Regional On Demand Pilot Program. Busways North Coast will operate the services in the same regions we already operate school bus and town bus services. When will the trial services commence? This trial will commence on Wednesday 16 January 2019. What day do the trial services operate? Cooee Busways services run weekly on Wednesday (except public holidays). Why does the service only operate on Wednesdays? Busways is operating this trial under TfNSW’s Rural & Regional On Demand Public Transport Pilot Program. Community and passenger surveys will form part of our community engagement and will influence any future changes and improvements. Wednesday has been chosen to suit a number of operational considerations and as a starting point to promote and encourage the public to try the service. Feedback throughout the trial may influence the day of the week in the future. Cooee Busways is operated by Busways as part of the NSW Government’s Rural and Regional On Demand public transport pilot program. We are an Australian owned and operated business, with 17 depots across NSW with 750+ buses and 1400+ employees. We operate the local school and route bus services in each of the Cooee Busways areas so we know the roads and communities very well. We‘re proud to be partnering with TfNSW to trial innovative solutions to improve public transport in regional NSW. Can I book a trip with multiple stops? 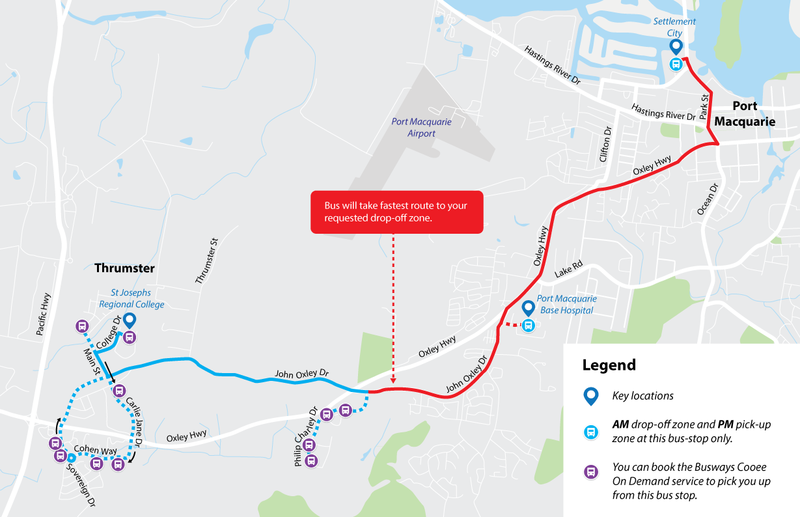 No, Cooee Busways is a point-to-point service that will transport you from your pick up location to your regional town centre for shopping, recreational activities, attend medical or business appointments or to connect with our local bus network. What types of buses are used? 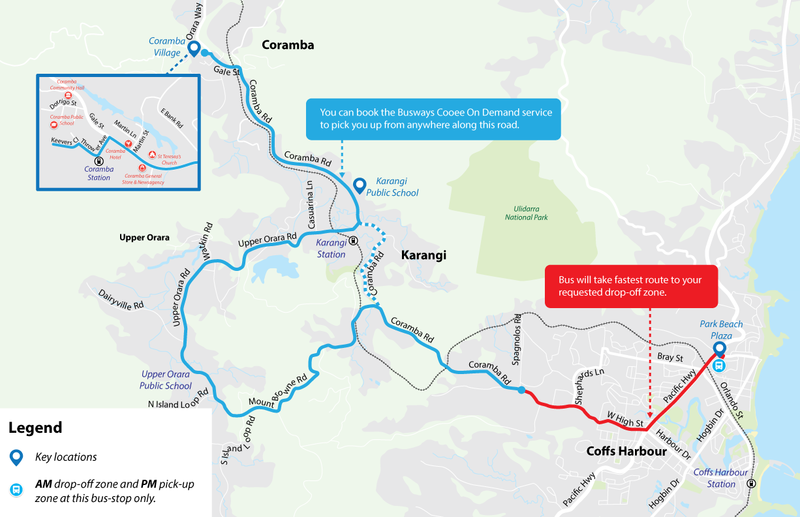 The Cooee Busways fleet comprises of standard sized buses, with the exception of a mini-bus operating the Upper Rollands Plains to Port Macquarie via Telegraph Point trial service. How will I recognise the bus that is picking me up? Cooee Busways buses are clearly marked with the NSW Government On Demand branding and Cooee Busways logo. For buses with an electronic destination sign (located above the front windshield) the Cooee logo and route description will be shown. How many people can travel at the same time in the same vehicle? Vehicles can seat up to 56 customers. For safety reasons, due the nature of some long distance routes, standing passengers are not permitted. How can I provide feedback on my trip? What do I do if I have left something on board a Cooee vehicle? For lost property enquiries, please contact us by calling (02) 9497 1870. Can children travel unaccompanied on a Cooee service? Children under 12 years of age cannot travel without an adult on Cooee Busways services. Bookings can only be made by customers who are 16 years and older. Can I book for more than one passenger on one booking? Yes, when booking by phone you can advise us how many passengers you are booking for, or if booking online, simply add the number of passengers travelling on the online booking form. No, there is no cancellation fee for Cooee Busways services. Is there a customer Code of Conduct on board Cooee Busways Services? How do I know the bus will be on time? If there are any delays with the Cooee services you will be notified by our Customer Service staff on the mobile number provided at the time of booking. You can book a trip up to one week in advance, and by 4:30pm on the day before your trip at the latest. We recommend you book as early as possible to reserve a seat. If you book by phone and provide us with your email address, we will send a booking confirmation to this address as well as a phone confirmation the day before travel. You can only change or cancel your booking by calling us on (02) 9497 1870 or emailing infoline@busways.com.au. As other customers will be using the service, we recommend that you cancel your trip the day before, so we can provide the most efficient service to our customers. All payments are made by cash directly to the driver upon boarding the service. Please have the correct fare ready for the driver where possible. Credit, debit and pay wave card facilities are not available. Regional Excursion Daily (RED) tickets are also accepted on these services. Are concessions available for this service? Concession fares are available to eligible Transport Concession Entitlement Card holders including seniors, pensioners, children, students, apprentices, Centrelink customers, asylum seekers, people with disabilities and veterans and war widow/ers. Please ensure you carry the appropriate Concession Entitlement Card to show the driver when boarding. Does the service cater for people with mobility issues? At the moment these services are not operated by wheelchair accessible buses. 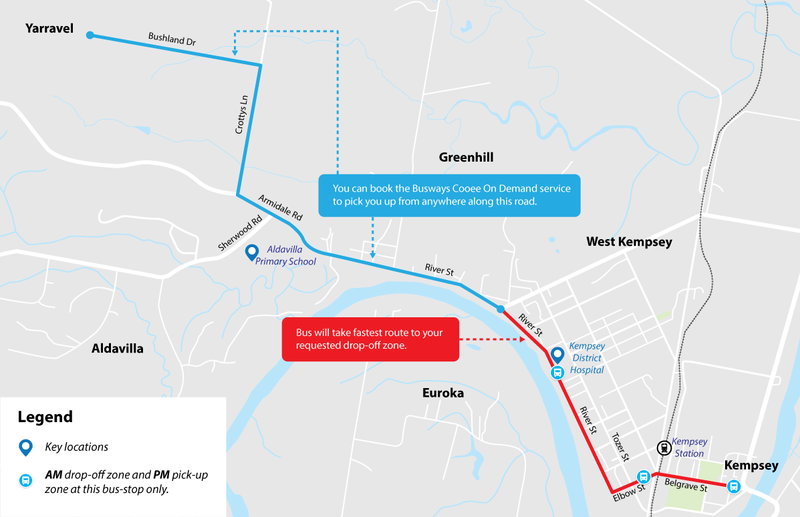 The trial will utilise existing school buses, between school drop-off and pick-up times, to provide a transport service where there are currently service gaps. We are testing this as an efficient solution for regional areas, instead of school buses operating empty back to town. Can I travel with an assistance animal or Guide Dog? Approved assistance animals and Guide Dogs are allowed on all vehicles and may travel for free. Can I travel with a pram or large items? 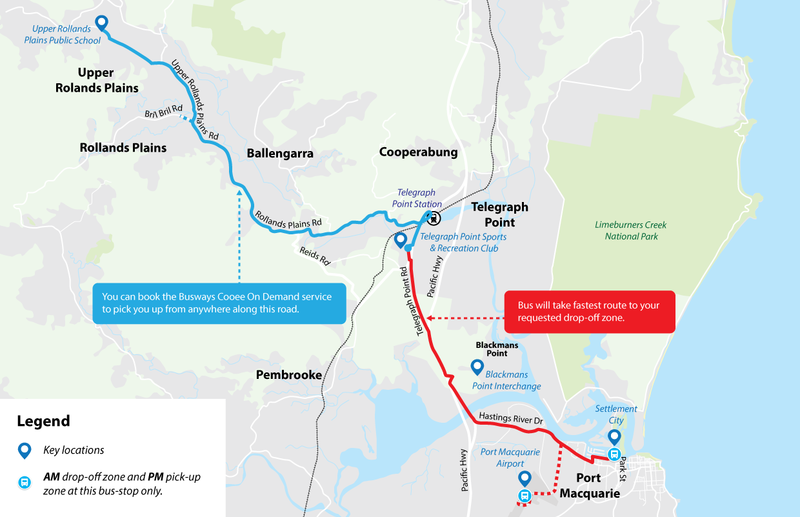 A mini-bus will be used to service the Upper Rollands Plains to Port Macquarie via Telegraph Point pilot and will not be suitable for large items. All other Cooee Busways services are suitable for prams or strollers, or large items such as bikes, surfboards or carry-on luggage, providing they do not inconvenience or obstruct other customers.